I’m a mad coffee nut, so when I got the chance to spend a few days in Istanbul last year my thoughts immediately turned to coffee. 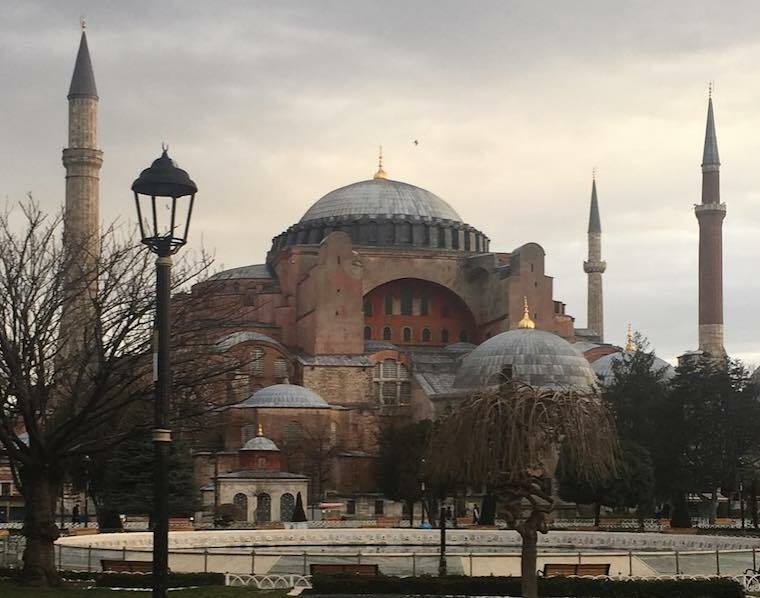 Turkey has a rich an interesting history (just look at the gorgeous Hagia Sophia I visited just above) and its coffee culture is so unlike what we’re used. 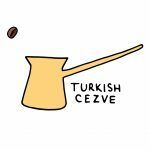 It refers to a method of making coffee popular in Turkey and some surrounding countries where fine coffee grounds are boiled in a pot (called a Cezfe or Ibrik) over a flame. No filter is used which results in a thick, full-bodied coffee that has a large amount of grounds left in the cup you drink it from. 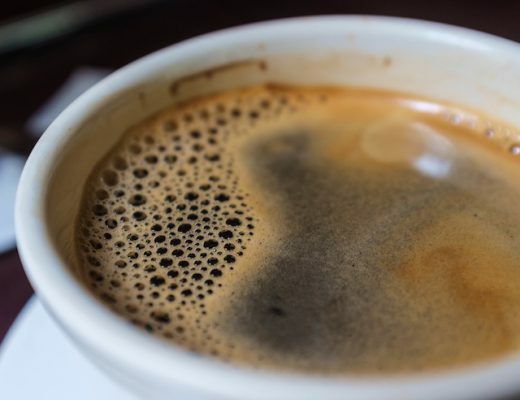 Now the Turkish have been making this style of coffee for way longer than the rest of us, Turkish coffee is centuries older than Italian style espresso for instance. So in some ways it’s like taking a trip to the past with all its idiosyncracies and I have to say, some of the most beautiful coffee making devices you’ll ever see. I hope the photos in this article do it justice. Turkish coffee refers to a way of making coffee rather than a brand or type of coffee bean. It uses a gorgeous pot with a handle which is a called a cezve which you hold over a flame and let the coffee grounds and water bubble and brew inside. This way of making coffee is centuries old, perhaps (or even probably) the oldest method that is still around. 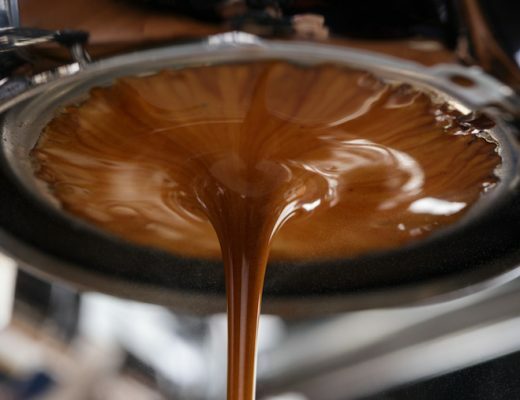 Once the brewing is done, you simply pour the entire contents, grounds and all, into the cup. The method of making Turkish coffee will seem strange to those used to hyper modern creations like a Clever Dripper or an Aeropress. There is no filter and no straining of the coffee. The coffee grounds go into the cup along with the coffee! This results in a unique and polarizing taste. There is actually no Turkish coffee beans in the sense that they were grown there. The country is a little too northern to be suitable for growing coffee. You can use any coffee beans to make Turkish coffee, it seems like darker roasts seem to be preferred with its fuller-bodied taste. First we have our Turkish coffee grinder. Here’s a picture of a really nice ornate-looking one. 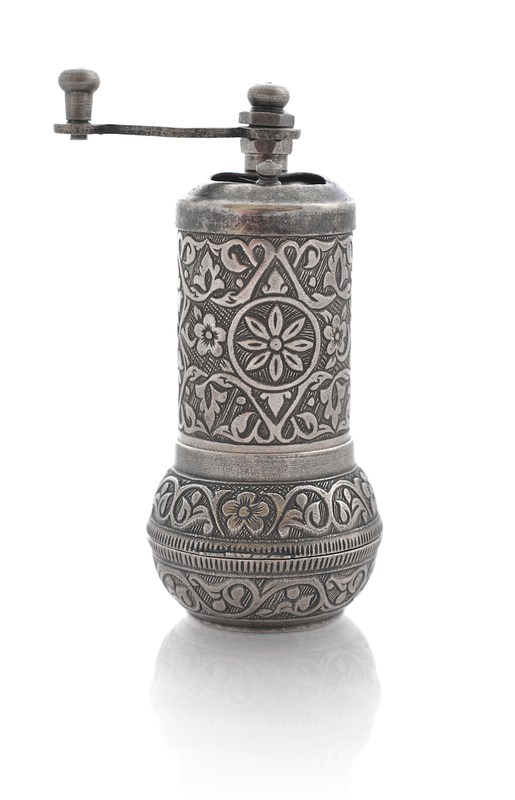 These are often used because of Turkish coffee’s unusually large grind size (more on that later), which many modern coffee grinders cannot product. 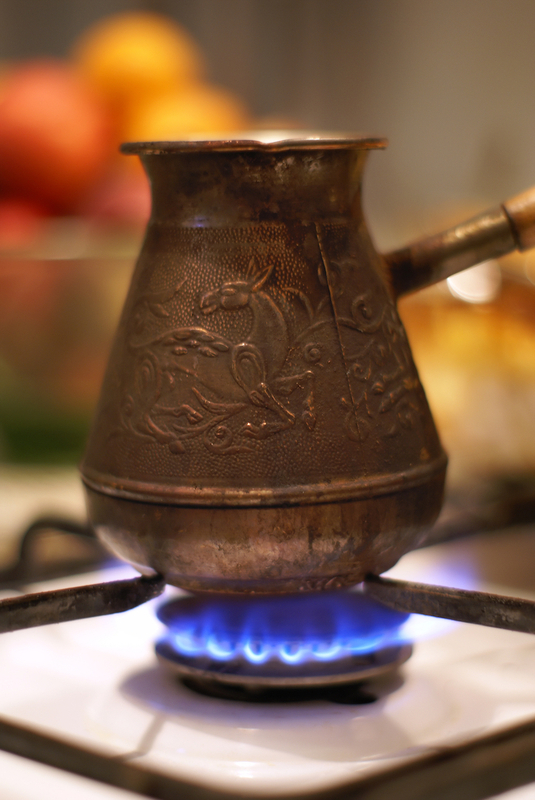 Next is our cezfe This is the little pot – usually made from copper – where we brew our coffee. You add the coffee and water then place your cezve over a flame. This is also sometimes called an ibrik. This is a slight mistranslation which has caught on, leading to Ibrik World Championships which may as well be called the Turkish Coffee World Championships. Here, take a look. Lastly, you’re going to need a flame, too. You can use a gas burner or have a separate device, both work. You can use any coffee. The most popular coffee beans in Turkey are Brazilian. I’m not super experienced and I don’t have my own setup, but if I was going to experiment I’d look at combining the method with some sweet and fruity African single origins and seeing if I could make that work. Here’s my attempt at the main steps for making an authentic Turkish coffee. I recommend following along with the video below to see what’s going on in real time. 1. Grind your coffee – super fine. 2. Add the coffee and room temperature water to your cezve. 3. Place your cezve on the flame (medium-high heat). 4. Bring it to a simmer then turn heat down to low..
5. Let the coffee foam up. 6. Pour the coffee slowly into your cup – grounds and all. 7. Serve in an ornate cup with soda water and lokum. The general idea is to let the coffee and water foam up in the cezfe. You want to let it rise up and foam 2-4 times before it’s finished. The art of making good Turkish coffee in creating the foam. A good cup contains 50% foam or even more! Try doing it yourself and you’ll realize what a skill this is! Important: Don’t let the coffee boil. It should be brought to a mild simmer and nothing more. If you go into full boiling then your coffee is probably dead. The ideal temperature is about 160F (or 71C) which is way below boiling point at 212F (or 100C). The water served with the coffee is not optional. The Turkish use to it clean their palate before they enjoy their coffee. You can use plain cold water but a seltzer seems to be preferred and more effective. Also, I mentioned lokum above. This is a tasty candy that is sold under the name ‘Turkish Delight’ abroad. I really like it and it’s a great accompaniment to Turkish coffee. Get some if you can. What Kind Of A Grind Is Used? 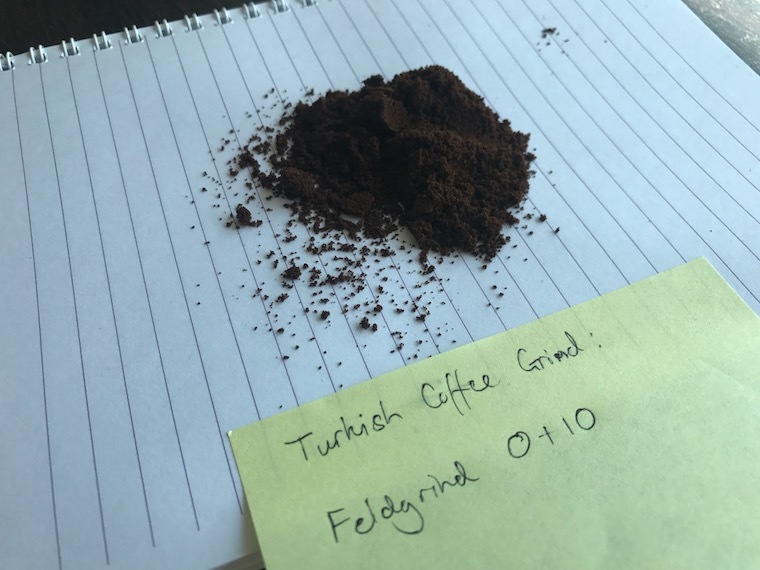 The most remarkable feature of Turkish coffee – in my opinion – is the grind. The grind needed to make Turkish coffee is usually the finest most people know – even finer than espresso, it’s almost a powder. It’s so fine that many grinders do not have a setting that can produce a grind fine enough. If you’d like to try making it yourself you’ll need to check whether yours can achieve this grind. The traditional method is to use a Turkish hand grinder. These are often beautifully ornate little things that are great to look at but awful to use. Grinding enough coffee at that fine a grind takes a long, long time. Update: I decided to try out making a grind fine enough myself. A touch of internet sleuthing revealed that a setting of 0+10 on my trusty Feldgrind is about right, photo below. As you can see, it’s very fine, similar to espresso. I suppose that’s to be expected as it’s only a couple of dials down from it. By the way, if it doesn’t look that fine it’s because it’s so powdery that it’s clumping together in bigger lots. Anyway, it took about twice as long as it usually does so not sure if I wanna make a regular thing of it! Do Turkish People Actually Drink It? It’s 500 years old, lots of newer and better methods exist and are popular in Turkey as they are anywhere else. Walk aruond the streets of Istanbul and you’ll see cool coffee houses everywhere. The third wave of coffee did not escape the place where East meets West. Despite this, Turkish coffee is still in full evidence. Most of the newer and hipper establishments will serve Turkish coffee. And many restaurants, bars and hotels will offer Turkish coffee as a matter of habit. This was in the modern capital city of Istanbul, to be fair. If I had trekked to deepest Anatolia I would’ve seen something quite different. My guess would be modern coffee culture would not be quite as prevalent and the old ways of Turkish coffee still very much in evidence. In fact, Turkey is not the only place this method of making coffee is popular, you can find it in many countries in the vicinity including Bosnia and Herzegovina, Greeze, Iran and the Czech Republic. How Does Turkish Coffee Taste? 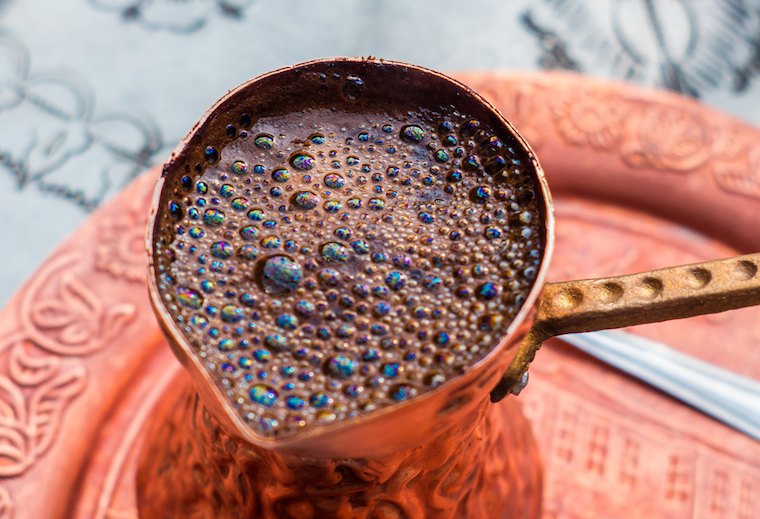 Turkish coffee uses an immersion method with no filter. This means all the rich coffee oils and micro-particles as well as the finer coffee grounds will make it into your cup. 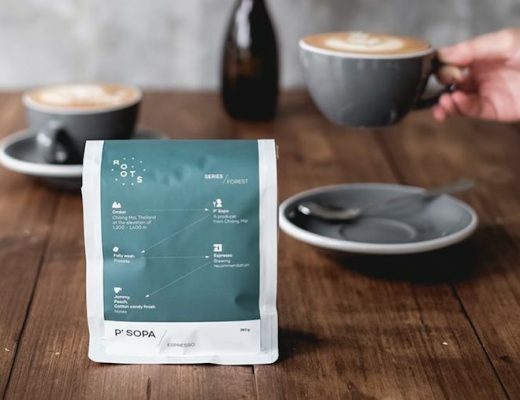 This produces a coffee that is naturally full bodied and silty and will highlight the heavier, earthy flavors. Turkish coffee’s trademark is the full-bodied taste that comes from not using a filter. The body of a coffee, and its opposite, the clarity, are two huge features of the taste of coffee that seems to be very poorly understood. If you’d like to learn more, check out the article I wrote about this here. You will see many recommendations to drink darker coffees using the Turkish method – it will magnify the earthy and herbal notes of Asian coffee beans and the burnt taste of dark roasts. It seemed like this was the preferred option for the places I bought Turkish Coffee. I would personally be interested in pairing it with a fruity and juicy African single origin. I think the contrast could turn out quite pleasing. The coffee will be silty, the lack of a filter means that the whole slurry of coffee and grounds gets poured into your cup. For me, the last dregs are nigh on undrinkable. You can gulp those grounds straight down if you like. I’ve come across a nutcase or two in my time who would treasure the last sediment-filled sip of their French Press coffee. 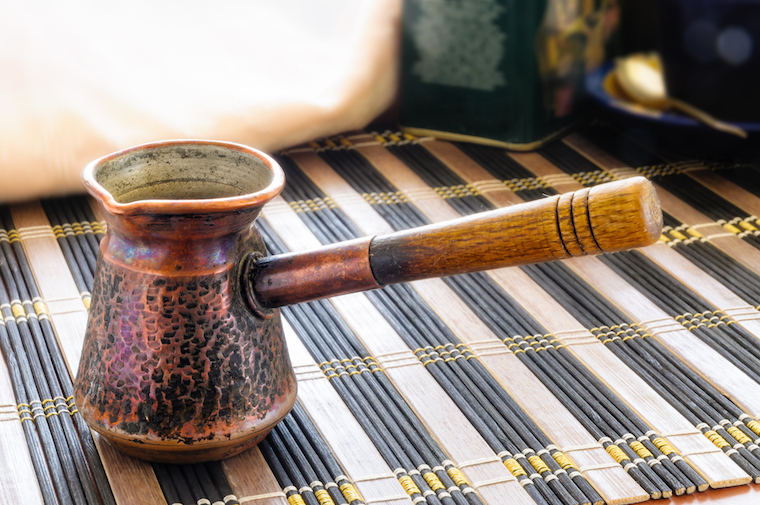 What Is The History Of Turkish Coffee? Turkey’s an interesting place. If you asked the average Joe about the country he might say it’s known for kebabs, furniture and a tenuous hold on democracy. Oh, and these hilariously infuriating ice cream sellers. 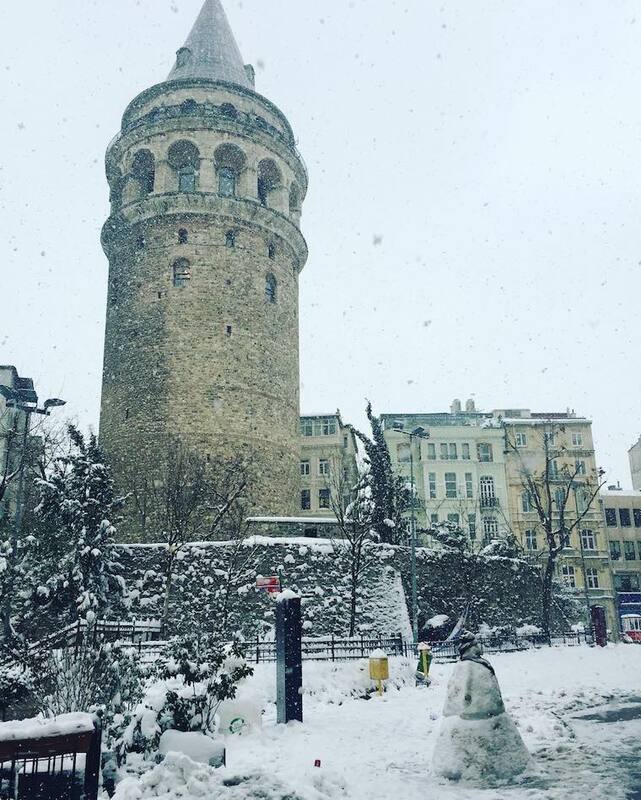 The centrepoint of the Ottoman empire and the Byzantine before that, Turkey has a rich culture and a turbulent history. A small but notable part of its culture is its coffee. Turkey was making coffee a long time ago. The plant was originally discovered in Ethiopia in the 11th century before slowly making its way across the globe. It found its way to Yemen a few centuries later and then to nearby Istanbul where a distinct coffee culture emerged. One which is still unique across all modern methods of making coffee. So we’re talking about a custom that has been going several hundred years! That’s an ancient tradition compared to the 21st century Aeropress. Firstly, let me qualify my thoughts by saying I’m not an expert. I have been to Turkey but only for a few days. I tried Turkish coffee a few times in a few places and I have played around with a few devices away from the country. But again, I am no expert. I enjoy Turkish coffee but I am certainly not the number one fan. It has always tasted overly bitter for me. I’m also not a fan of the silty texture either, if you’ve tried finished the last gulp of a French Press you’ll know what I’m talking about. As such, I’ve never invested in my own equipment. I do like the process, it’s much more of an art form that chucking your coffee into a french press and it’s an entracing joy to watch someone do it. A part of me wants to spend the time to master it. One day, perhaps. One for the bucket list, if you like. How Can I Make Some Myself? The minimum equipment you need is a cezve (or ibrik) and a flame to heat with. While I am no expert, it seems like substituting something else for the cezve would be inadvisable given what a tricky process it already is. Luckily we live in world of abundance and there are some stunning cezve’s that you can check out on Amazon here. In addition, you need to be able to grind your coffee extremely fine, we’re talking like powder. It’s the most fine of any method of brewing coffee, even more so espresso. Unfortunately, many (cheaper) grinders will either make a poor attempt at grinder that size or will simply not even have a setting. A quick Google search should give you the information you require. You do have the option of buying a Turkish coffee grinder although I can’t seem to find one with good reviews that are easily available, you’ll have to do your own research on this I’m afraid. P.S. I’m going to make another shameless plug for this beautiful country. The political climate there is tense at the moment of writing (2018) and most Turks I spoke to were quite despondent, sadly. They really appreciated visitors and were among the friendliest folks of any country I’ve been to. The coffee culture there is amazing, whether western/Italian style or Turkish coffee. There were many Third Wave-esque coffee shops around, I didn’t have to look hard to run into them, and they all offered espresso coffee and Turkish coffee and whichever you chose it was fantastic. There was one place (I forget the name of it but it was near Galata tower) which also offered Aeropress and V60 brews if you wanted, I thought that’s a lot of training they must have to do for new baristas! Anyway, here’s my favorite photo from the trip. 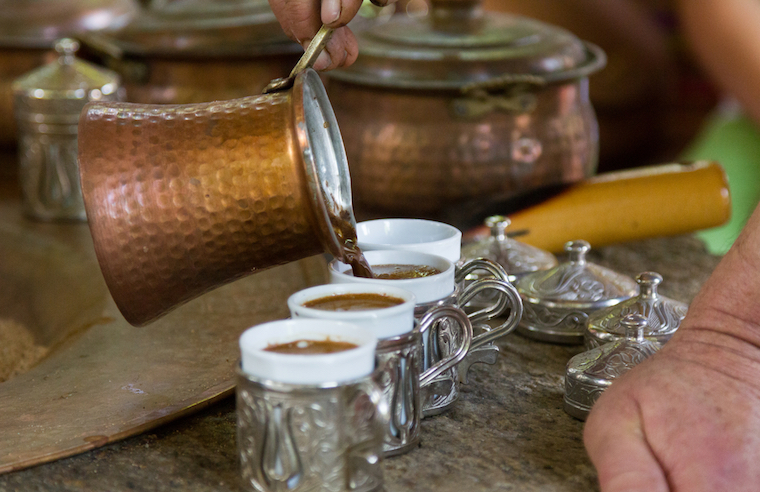 Lastly… if Turkish coffee takes your fancy, then you might be interested in 7 other countries that have some of the most interesting coffee cultures. 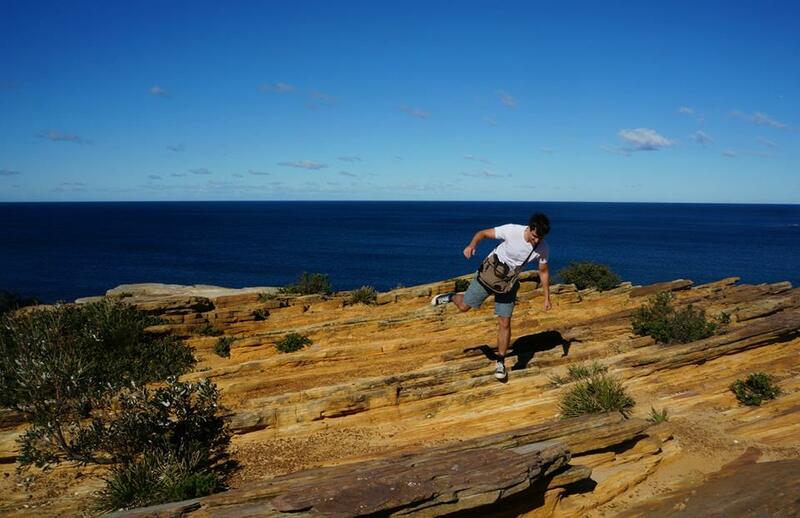 We’ve got the awesome third wave-ness of Australia and the hilariously accidental Greek coffee culture. Take a look at the article here if you like.